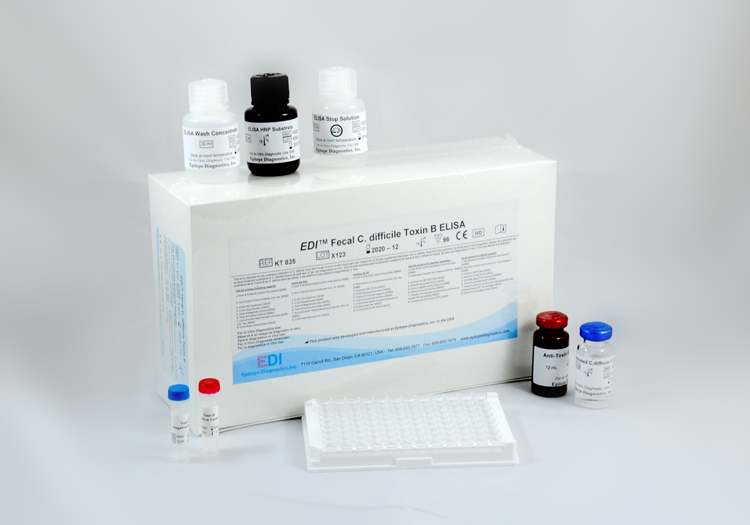 KT-836 C. difficile Toxin A and B ELISA Kit — Epitope Diagnostics, Inc. This microplate-based ELISA (enzyme linked immunosorbent assay) kit is intended for the qualitative detection of C. difficile Toxin B in feces. The assay is a useful tool as an aid of detection of C. difficile infection. Clostridium difficile is a common pathogen and a major cause of infectious diarrhea in hospitalized patients. While most strains produce both Toxin A and Toxin B, some only produce one or the other. These enterotoxins, which are both proinflamatory and cytotoxic, attack the mucosal lining of the intestines. If not identified and treated in a timely fashion, it can result in permanent damage to the colon or colitis. This assay employs an antibody specific to both Toxin A and B.